It is the mode of arrangement of flower in a group in a specialized branch called peduncle. It consists of inflorescence axis and mother axis. Peduncles are of two types- receptacle and scape. 1. Racemose inflorescence - It is of two types. Typical Raceme - Unbranched, elongated peduncle bearing pedicellate or stalked flowers acropetally. Example - Delphinium, Linaria etc. Corymb - All the acropetally arranged flowers come to lie at the same level due to slight shortening or elongation of peduncles of lower flowers. Example- candytuft. Corymbose raceme - Like a corymb near the growing point and raceme lower down though the peduncles of the lower flower are longer. Example - mustard. Umbel - Pedicellate flowersarranged centripetally around an extremely reduced peduncle with an involucre below. Example - Brahmi booti, hydrocotyle. Spike - Sessile flowers borne acropetally over an elongated peduncle. Example –bottle brush, Amaranthus. Spikelets - It is a compact spike having a few flowers born on axis called rachilla and surrounded by two scales called glumes. Example- wheat, oat, grass etc. Strobile - It is a spike in which the flowers develop in the axils of persistent membranous bracts. Example- Hop. Catkin - Compact unisexual spike often hanging. Example-Mulberry, Willow,Birch. Spadix - It is a modification of catkin in which the peduncle is fleshy and thick with upper part sterile and lower part bearing one or both the types of unisexual flowers surrounded by a large bract called spathe. Example-In maize the female flower develops in a spadix. Capitulum - Peduncle is flattened to form receptacle that bears the centripetally arranged Sessile flowers or florets surrounded by involucre of bracts. Example- Cosmos, Zinnia, Chrysanthemum etc. 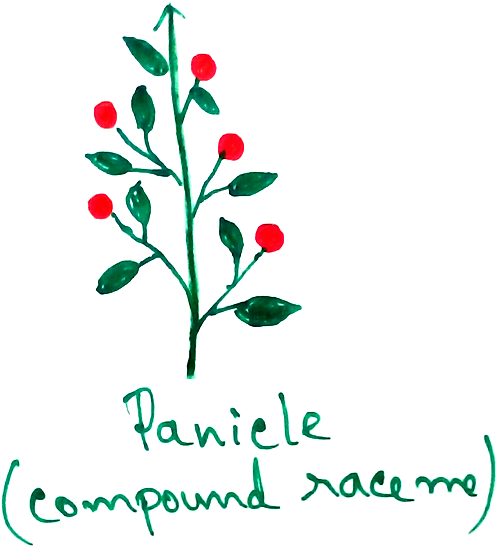 Raceme of racemes - Racemes are born acropetally on a raceme. Example - yucca, Asparagus etc. 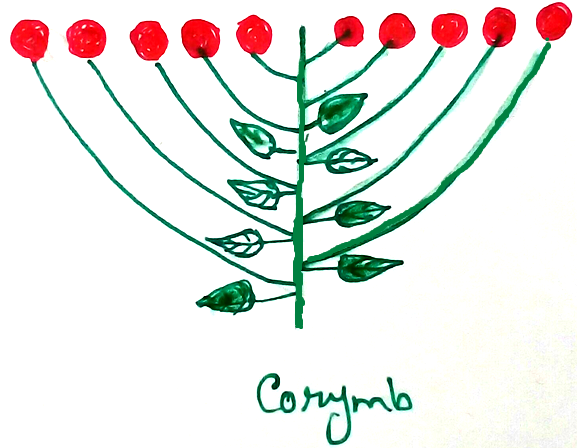 Corymb of corymbs – An axis bearinga number of corymbs in a corymbose fashion. Example - Cauliflower, Pyrus. Umbel of umbels - Many umbels develops from a common point in an umbellate fashion. Example - coriander, carrot, cumin. Spike of spikelets - Example - Wheat. Spadix of spadices - Example – Date pulm, Coconut. Capitulum of capitula - Echinops. 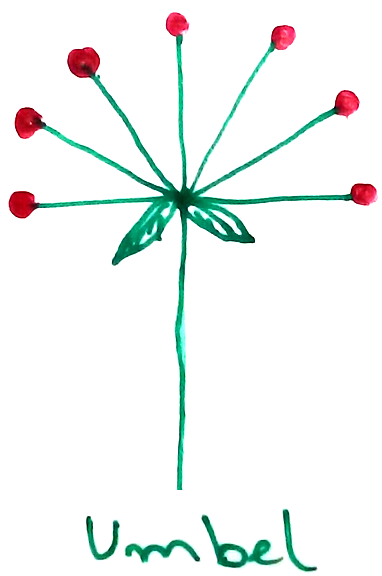 Uniparous – Example – Begonia, Drosera. Biparous – Example - Dianthus, Nyctanthes. Cymose head – Kadam, Acacia. Thyrsus – Cymose cluster arranged acropetally. Example - grape vine. Mixed spadix – Spadices have cymose inflorescence arranged acropetally on fleshy axis. Example - Banana. Panicle of spikelets – Spikelets arranged in a compound raceme. Example- oat, rice. 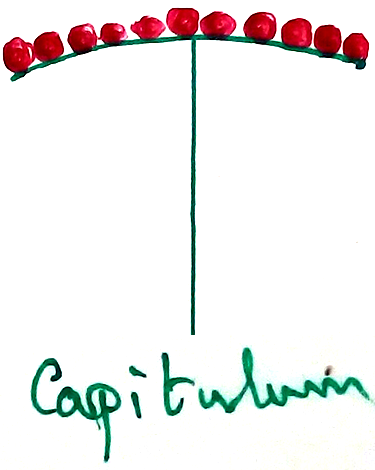 Corymb of capitula – Example- Ageratum. Other types – Like umbel of capitula, cyme of umbels . Example- Lantana. Hypanthodium – It is flask shaped fleshy (male flowers),a pore or ostiole lined by scales and a short canal bearing hair. Example- peepal, banyan. Coenanthium – Saucer shaped receptacle with upturn margin bearing florets. Example-Dorstenia . 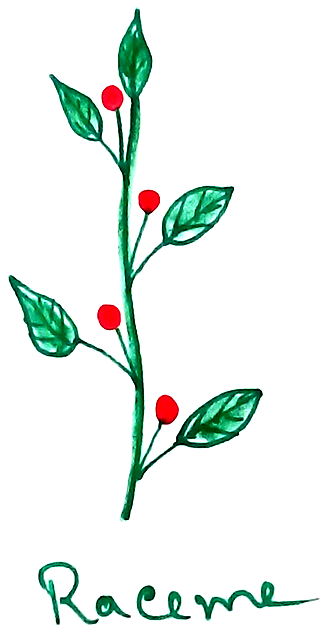 Verticillaster – It is raceme of verticles or whorls of flowers born in the axile of opposite leaves . Example- Ocimum, salvia. Cyanthium – Consists of involucre of 5 fused bracts that encloses a central achlamydeous pedicellate tricarpellary,syncarpous female. Example-Euphorbia.